Pigeon Theatre, in a new work that tours the UK this Spring 2013, celebrate and interrogate the workings of the nose and the brain. 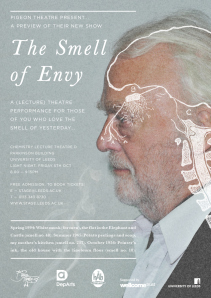 The Smell of Envy is a collaboration with Cognitive Neuroscientist Dr Colin Lever at the University of Durham. It is an outcome of the Wellcome Trust funded project Site and Smell and supported by Arts Council England, the University of Leeds and hÅb & Word of Warning. The show uses a company of older actors and their memories and is part cookery demonstration, part science experiment, part neuroscience lecture (for beginners!) and part smell laboratory. Using a smell-scape of familiar and unfamiliar smells, this is a show about love and death and nostalgia and ageing and desire and loathing and envy. Pigeon Theatre are a Manchester and Leeds-based contemporary performance company. Their work is experimental and interactive – they use nontraditional spaces and unconventional social arrangements to create shared intimacies between them and their audience. They have been making and touring innovative theatre since 2001.